Pip, Squeak and Wilfred were characters in a comic strip which first appeared in the "DAILY MIRROR" newspaper on the 12th of May 1919. Pip was a dog, Squeak a penguin and Wilfred was a rabbit. Pip and Squeak were portrayed as being Wilfred's parents and there was also an additional supporting cast. The comic strip was extremely popular and became a craze in the 20's. After the First World War 1914-18, three medals were awarded to most of the British servicemen that had served from 1914 or 1915. 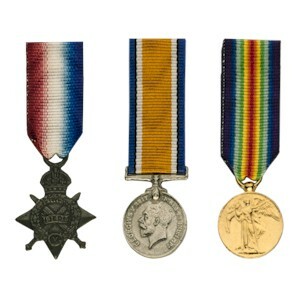 They were the British War Medal, the Victory Medal and either the 1914 Star or the 1914-15 Star. The issue of these medals coincided with the start of the comic strip craze and the three medals soon became known as Pip, Squeak and Wilfred, and are still so to this day. Description: A crowned four-pointed star was crossed swords and a wreath of oak leaves, having the royal cypher at the foot and a central scroll inscribed 1914-15. Comments: This medal was awarded to those who saw service in any theatre of war between 5th August 1914 and 31st December 1915, other than those who had already qualified for the 1914 Star.